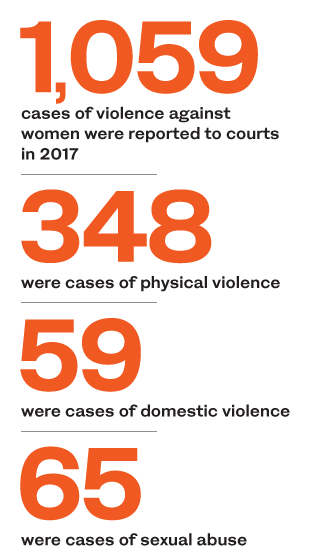 Since the UN issued the Declaration on the Elimination of Violence Against Women in 1993, Saudi Arabia has taken steady steps toward protecting women and upholding their rights. In 2013, the Kingdom adopted a law criminalizing domestic violence, which usually targets women and children. As the institution concerned with the implementation of this law, the Ministry of Labor and Social Development established the social protection unit. Its responsibilities include receiving reports and dealing with cases from beginning to end in collaboration with the relevant authorities. The ministry formed 17 committees for social protection in the Kingdom’s main regions, and contracted a number of charitable societies in areas where the social protection branches are absent. It also established a center to receive reports of violence and abuse on a toll-free number (1919)that runs for 24 hours with an all-female staff. The branches immediately intervene in cases of abuse, and coordinate with relevant authorities within a timeframe of two to six hours from the first report, based on the seriousness of the situation. Moreover, they are responsible for designing programs to deal with perpetrators of violence. The aim is to study their health and psychological conditions, and help them become better family members. For years, the ministry has been carrying out awareness campaigns to tackle the issue of violence against women, and implementing training and rehabilitation programs for groups exposed to violence, in cooperation with other governmental bodies, including the National Family Safety Program. In June, Saudi Arabia’s deputy minister of labor and social development, Dr. Tamader Al-Rammah, was elected to the UN Committee on the Elimination of Discrimination Against Women, a 23-member body that monitors implementation of the Convention on the Elimination of All Forms of Discrimination against Women. It reviews country reports and adopts recommendations, receives complaints from individuals or groups concerning violations of rights protected under the convention, and initiates inquiries into situations of grave or systematic violations of women’s rights. One achievement this year was the addition of a new anti-harassment law. The penalties range from a prison term of up to two years and/or a SR100,000 ($26,600) fine, to prison terms of up to five years and/or a maximum SR300,000 fine.